We believe real estate brokerages and agents are not maximizing their earnings due to poor communication and time consuming marketing processes. 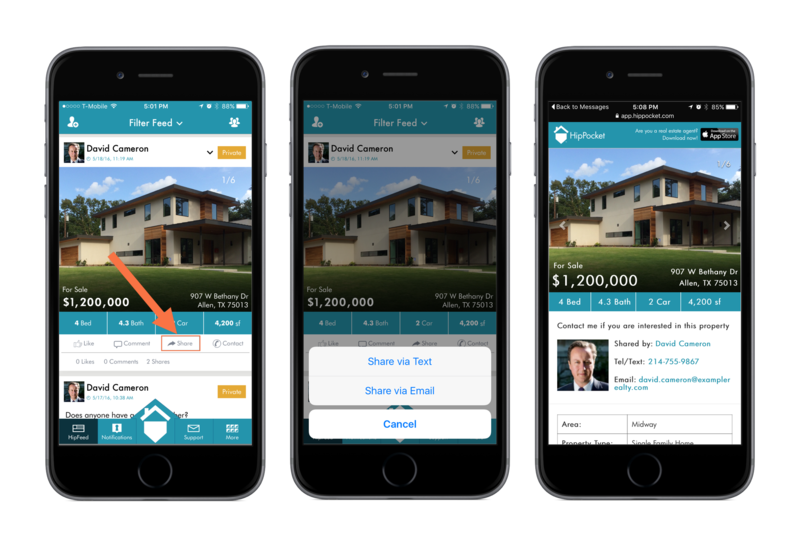 We created HipPocket for Brokerages to modernize property marketing for the mobile real estate agent workforce. HipPocket transforms how agents market to and communicate with other agents in their brokerage, their local agent community, and their personal network. 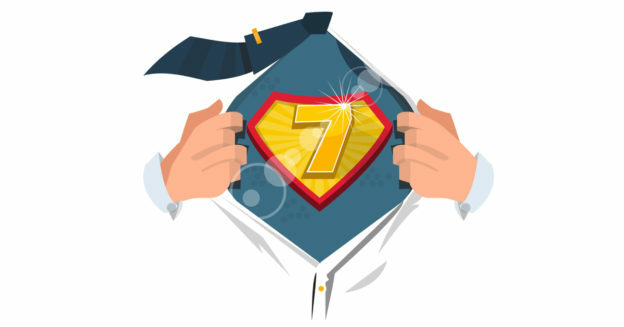 Here are 7 reasons why real estate brokerages choose to introduce a HipPocket powered internal marketing and messaging network. Rather than waiting until the weekly meeting or team email, agents can start marketing and messaging to their HipPocket Brokerage Network from the moment they have the listing agreement in their hands. Agents can market listing and needs and build private conversations together 24/7 in an off-email channel dedicated to helping agent communities do more deals together. A HipPocket powered Brokerage Network helps brokerages maximize their earnings by ensuring that opportunities for agents to work together in-house will never be missed. 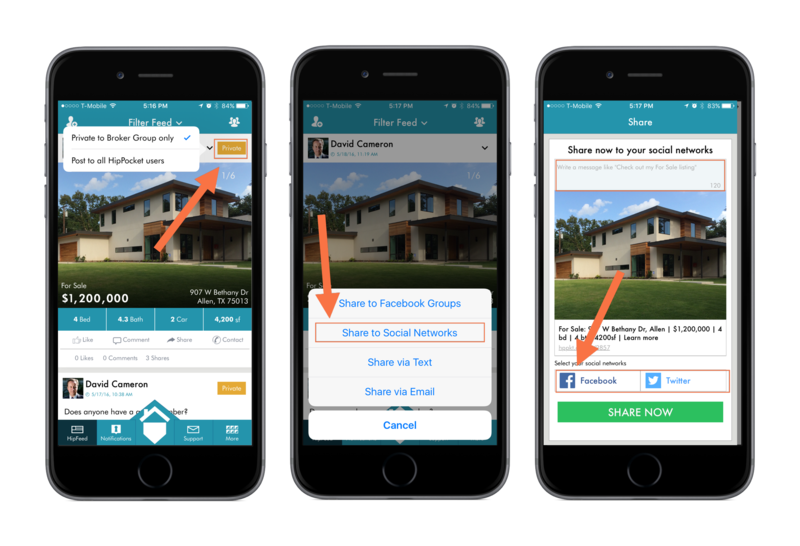 When an agent discovers a listing in their HipPocket Brokerage Network that suits a client need, they simply press “Share” on the post to share the listing by text or email. A snapshot of the listing is created on a professional webpage that includes all photos, basic information on the property, an interactive map and all contact details of the agent. Plus, the contact information for the agent is hyperlinked on the webpage so anyone viewing the page can press the telephone number or email address and instantly connect with the agent. Agents can get the word out fast to their clients and prospects without the need to configure a special email or campaign. Plus they look professional and uniform on the listing pages. Agents can seamlessly transition their original posts to their HipPocket Brokerage Network to their social networks. No need to upload photos and descriptions again in multiple posts in other networks. Agents first press the “Private” button on their post and release it to all the HipPocket Agents in their community to interact with. Then, by pressing “Share” on their listing, they can push it instantly into their Facebook and Twitter timelines. Along with a professional listing webpage, agents have the option to include a short note when they share into their social networks. This process saves some agents hours of reposting into their social networks. Agents get to focus on their clients and prospects versus social network marketing admin. Today, in addition to Facebook and Facebook Groups, HipPocket is connected to Twitter. In the future it will include other networks like LinkedIn, Instagram and Pinterest. 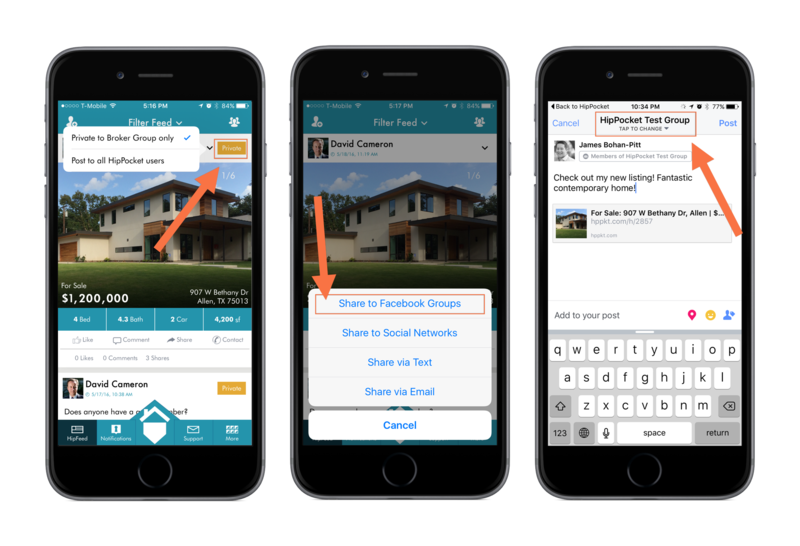 Like Hootsuite, HipPocket makes it easy to share listings across multiple networks in one shot. This means agents can market to a wide audience in minutes not hours. Agents can become more productive, spending less time on social network marketing and more time on prospecting and client management. Agents that are members of a number of Facebook Groups can share their listings from HipPocket directly into them. No need to upload photos and descriptions into multiple groups. Once an agent has transition their posting to their local HipPocket Agent Network, they can press “Share” and have the option to share it to a Facebook Group of their choice. To share to multiple groups, the agent simply repeats the “Share” exercise. Sadly, Facebook for spam protection purposes does not allow HipPocket to share posts to multiple Facebook groups. Even with this Facebook limitation, HipPocket still saves the agent a ton of time. Agents can continue to be members of any social group they want. HipPocket simply makes the process of marketing across multiple communities more efficient, improving agent productivity and focus. Agents that are members of a HipPocket Brokerage Network have access to a “Brokerage Directory” that allows them to see the contact details and postings from everyone in the network. One click shows the full member list and agents contact each agent using the “Contact” button on their profiles. For teams that don’t all carry each other’s telephone number around with them, this is a huge plus. It saves calling your broker for their number or logging into the MLS to get it. Also, every post in HipPocket includes a “Contact” button. 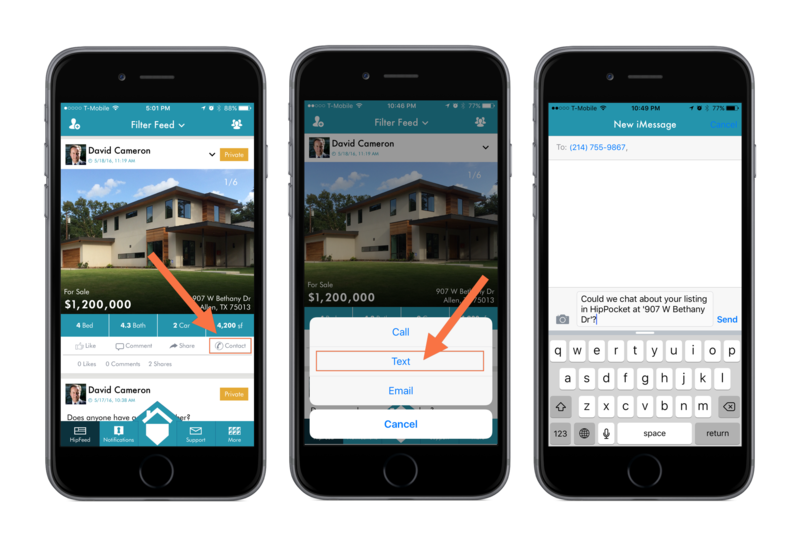 Agent to instantly connect through the HipPocket App to another agent by text, email or telephone. 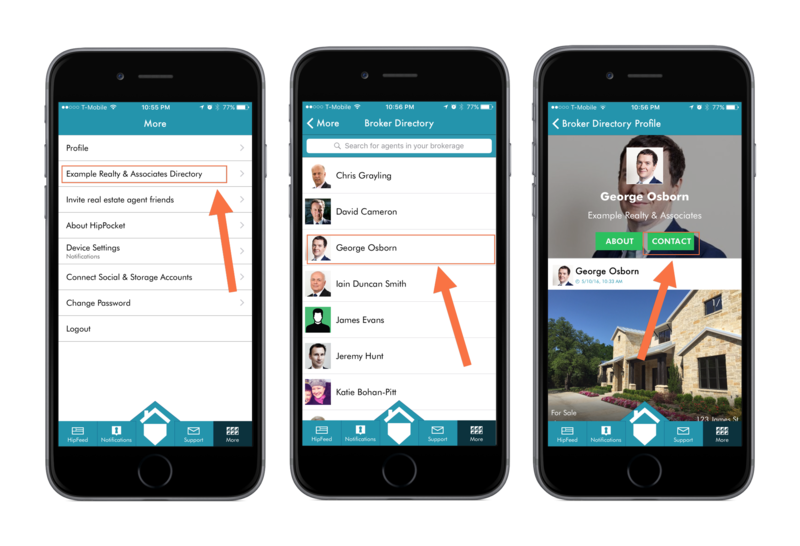 Agents will be able to instantly contact any one of their colleagues without the need to call the Office Manager or Broker for the number. HipPocket has been built from the ground up to respond to the needs of the mobile real estate agent workforce. Agents do not need another social network. They need somewhere to build real-time conversations with their agent peers and close more deals. The features available today in HipPocket for Brokerages focus on building a strong real estate specific Business-to-Business network and we will add new features in time that will reenforce this and add more value. Agents do not have the option to share listing posts instantly outside of the Facebook Group, forcing them to manually note the information, save the images, and then create a separate email or text message. Posts into a Facebook Group cannot be reposted to an agent’s Facebook timeline, other Facebook Groups or other social networks for all their followers to view. This forces the agent to type a brand new post and upload the photos again and again. In a Facebook Group, when posts include telephone numbers and emails, they are not hyperlinked and therefore cannot connect with an agent’s smartphone. Agents need to write the number or email down to then enter into their computer or phone instead. If a group member has not included their contact details in their post, an agent needs to retrieve it from their agent Facebook Profile. The profile is buried through multiple layers in Facebook and often will not include the agents telephone number and email when they get there. HipPocket gives a brokerage a competitive advantage. HipPocket powers an in-house marketing network designed to encourage more collaboration and more in-house deal closes. As the network grows with usage and membership, it becomes a critical place for agents to spend time daily, and a unique selling point to attract new agent talent. All HipPocket Brokerage Network owners will benefit from the continued development of new features. We are exploring features such as analytics for brokers to track the status of their teams listings; deeper search features, reporting and may be even some basic CRM features. We are determined to build a platform that is easy for real estate agents to adopt, while showing great value to both brokers and their agent community. Brokerages will have a directly line into the HipPocket Product Development Team to help steer them towards features that will solve the most pain points and add the most value. Check out our product page to learn more about HipPocket for Brokerages and also sign up. If you have any questions feel free to Email us. We’re looking to partner with brokerages all over the US and Canada and would love to hear from you. We’d even be happy setting you up on a free trial with a test network ahead of you subscribing. James Bohan-Pitt, CEO & Co-Founder of HipPocket. James is a technology entrepreneur with extensive experience in sales, product strategy, product development, operations and marketing. He has been a founder of several companies and worked in three early stage Fidelity Investments telecoms and technology portfolio companies. HipPocket is the culmination of his thoughts of using technology to ‘disrupt the paradigm’ and change the way the real estate industry operates from a communications and marketing stand point. HipPockets website would be awesome. Or even an app for Apple computers. I find myself quitting half way thru loading pictures to post a pocket listing since the phone takes too long. Hi Corey – I apologise for your struggles. We are not seeing a reduction in performance on our side. Is it only when you upload photos? As with many apps, it will take a bit of time to upload 15-25 photos. Plus we are beholden to the amount of Internet bandwidth you have on phone at the time. When you have a handful of bars on your phone or slow wifi performance will be impacted sadly. – Log in at HipPocket.com and load your listing from your laptop. We launched our desktop app in May but we know many users are unaware of it. – Connect your DropBox account to your iPhone app and upload HD photos from your cloud storage account. Naturally we are beholden to the size of the images but DropBox does work very well. Let me know how you get on. Happy to help!